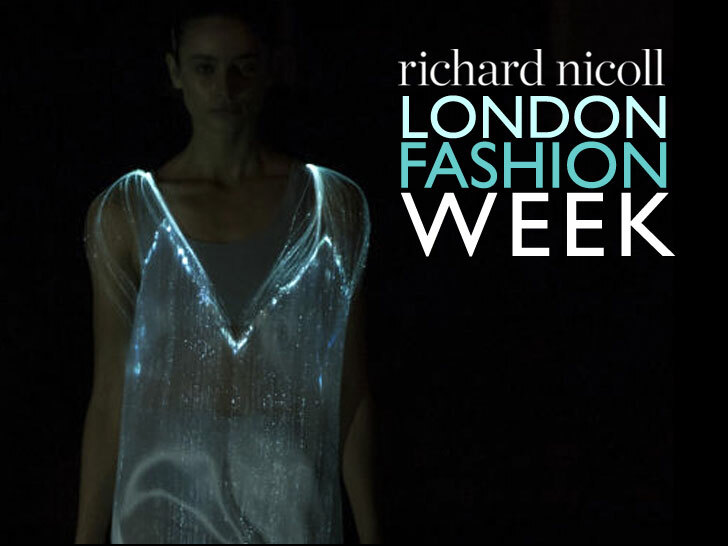 Richard Nicoll’s London Fashion Week outing had more than a smattering of faith, trust, and pixie dust. Sponsored by Disney, the Spring/Summer 2015 show featured five looks that owed more than a passing debt of inspiration to Tinkerbell, the feisty fairy whose depiction in the 1953 film Peter Pan is among her most iconic. Although Tinkerbell made only a few blink-and-you’ll-miss-her cameos in the collection—her silhouetted form could be spotted dangling off a few of the metallic shoulder bags—Nicholl’s finale look might as well have flown in from Never Never Land itself. Emerging on the darkened runway, the slip set the room aglow. The twinkling effect was less a product of magic, however, than a system of fiber optics and high-intensity LEDs. Nicoll worked with Studio XO, the same firm that masterminded Lady Gaga’s “flying dress,” to create the elegant showpiece. 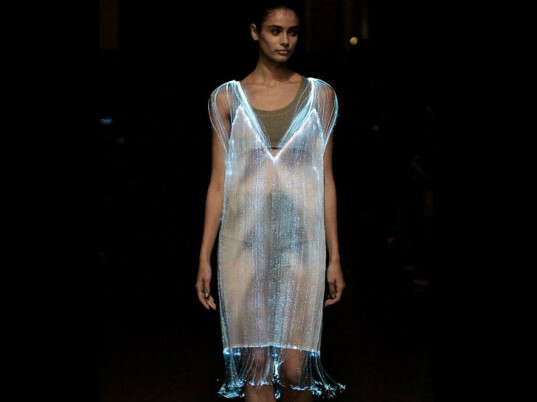 “It was imperative for Richard that what went down the catwalk was ‘fashion’ not ‘tech,'” Matthew Drinkwater, whose Fashion Innovation Agency played yenta to Nicholl, Studio XO, and Disney, told Forbes. Richard Nicoll's London Fashion Week outing had more than a smattering of faith, trust, and pixie dust. Sponsored by Disney, the Spring/Summer 2015 show featured five looks that owed more than a passing debt of inspiration to Tinkerbell, the feisty fairy whose depiction in the 1953 film Peter Pan is among her most iconic. Although Tinkerbell made only a few blink-and-you'll-miss-her cameos in the collection�her silhouetted form could be spotted dangling off a few of the metallic shoulder bags�Nicholl's finale look might as well have flown in from Never Never Land itself.